The “Maria and George Severeanu” collection features a very special piece representing the necklace of Maria Severeanu, made of 44 gems and cameos, one of which is placed like a medallion right in the center. It was crafted in its actual form in 1922 by a jeweler from Paris who was specialized in restoring ancient art monuments. Each piece is decorated and fitted in a golden frame. The iconography contains representations of human figures, gods and mythological scenes. From a technical point of view, the gems are decorated with an incised pattern – intaglio, using special sharp and girded instruments. 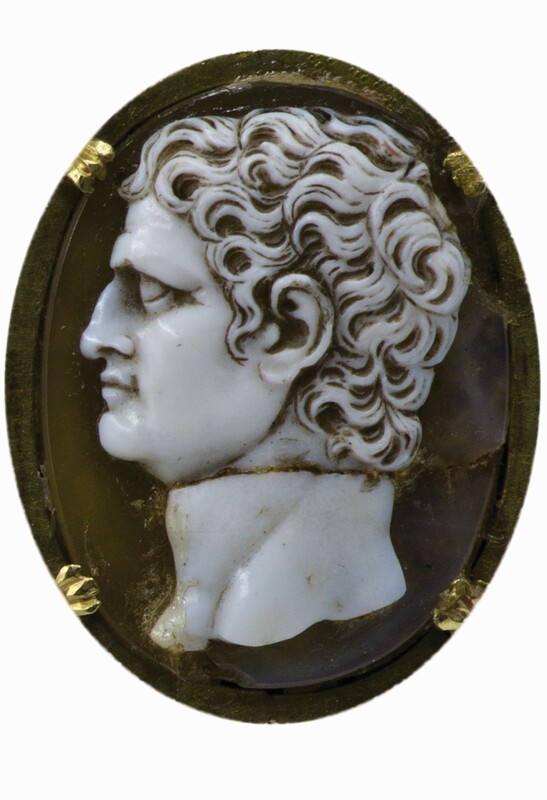 The cameos were among the most expensive jewels in Antiquity and were made by blowing two different layers of colored glass into the desired mold. After the glass cooled down, the outer white layer was polished until it revealed the bottom layer of a darker color. Six pieces were made during the Hellenistic era – 4th century B.C. – while the rest can be attributed to Roman jewelers of the 1st – 4th centuries A.D., some of them possibly being reproductions of later periods. The piece can be admired in the house which belonged to the Severeanu family, situated close to the Romana Square, on 26 Henri Coandă Street.